Quality Control vs. Quality Management: What’s the Difference? Organizations that have to manage a lot of documentation often fall into the conundrum: do we need a quality control system or a quality management system? Are they the same thing with different names, or are they different? Exactly what is a quality management system and what benefits does it bring for the whole quality management process? Quality is the bedrock of every business, but how do you get a handle on all its different aspects at your organization? The good news is that you can integrate a quality control and a quality management system into one software solution: ENSUR document management software. But first, it’s important to understand how quality control methods and the quality management process are different yet work in tandem to boost your business. Quality Management—The planning stage; where quality standards are agreed upon, responsible parties are assigned, specs are decided, meetings planned, and metrics are defined to determine how well the project meets the outlined specifications. Quality Control—During project implementation, responsible parties follow the plans and evaluate how well the project conforms to the specifications drawn up during the quality management phase above. 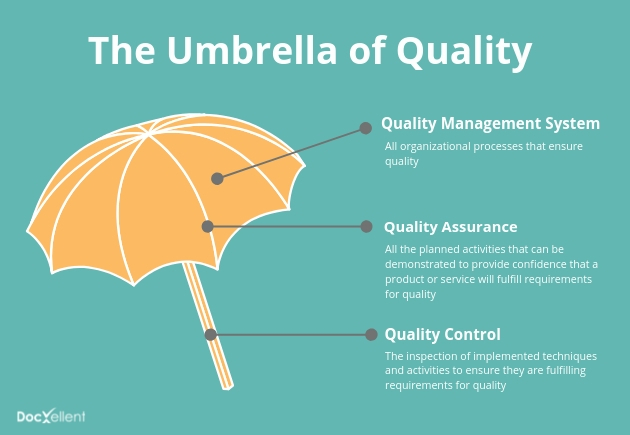 If quality management is the canopy of an umbrella, quality control is the handle—they’re different parts of the same process—quality management dictates all quality assurance methods (like the spokes of the umbrella). The ENSUR document control system brings them together in one seamless, easy-to-use software package that your entire company can use. This helps to ensure the original product discussed during the planning phase is top-quality in the end. Quality Assurance—QA focuses on fine-tuning the processes necessary to avoid defects in the end product. Quality Control—QC tests the end product to discover and root out defects. So, if QC finds defects, QA may go back and reevaluate processes to eliminate those end errors. ENSUR document management software can deftly tackle all your quality management system documentation, including customized documentation tailored to your industry or business. To get a first-hand look at how ENSUR can help you fine-tune all your quality control methods, schedule a free demo today.